I started with a coat of KBShimmer "Eyes White Open" and then sponged on a gradient of the four colors you see above, in that order. 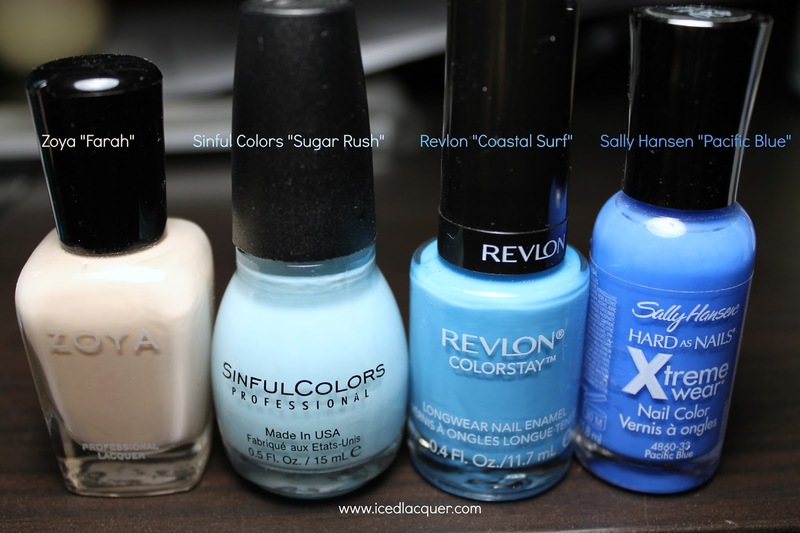 Zoya "Farah," Sinful Colors "Sugar Rush," Revlon "Coastal Surf," and Sally Hansen "Pacific Blue." I sponged the gradient on twice to make sure the colors were nice and vibrant. Then I used this method in Janelle Estep's Beach Nails tutorial to add the "waves" on top. I've heard that some people use spray hand sanitizer, but she suggests body spray that contains alcohol. Personally, I tried four different body sprays (all with alcohol!) and a hair spray (also with alcohol!) and just could not get the same beautiful, lacy spread that she got! My ring finger turned out to be my favorite nail. After adding the "waves" I sponged some Zoya "Farah" back over the cuticle section because I didn't want my waves to look like they were flooding the beach! ;) Then I dabbed a little bit of Sally Hansen "Disco Ball" right near the cuticles to give the sand a little bit of sparkle. 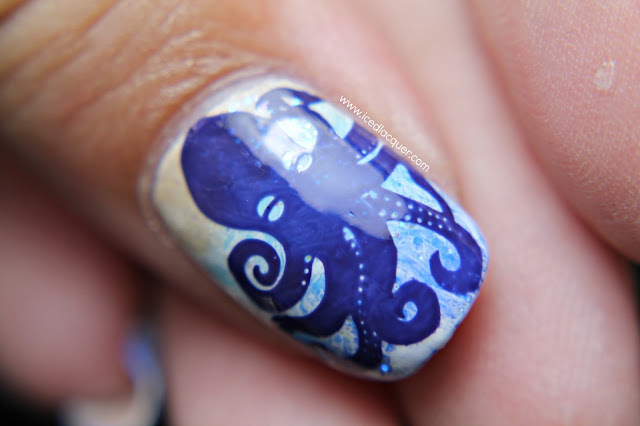 And just for fun I stamped a purple octopus onto my thumb using plate BM-401 and Essie "No More Film." So that's it! Please make sure you check out Courtney's version and let me know what you think of this look! Love! I need to do these! Your's turned out so well! I LOVE THEM. Your gradient is gorgeous and I like that you came back in with color and glitter for the sand.